A Jet2 flight heading for Tenerife was forced to divert to Manchester Airport due to a mid-air technical fault. 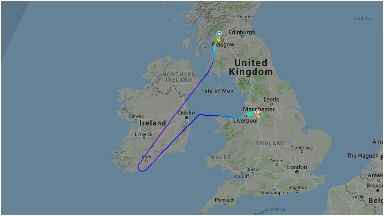 Flight LS155, a Boeing 737-8MG, took off from Glasgow Airport at around 8:55 on Sunday but was forced to turn around while flying over the Republic of Ireland. The flight then landed safely in Manchester Airport, with fire crews waiting. 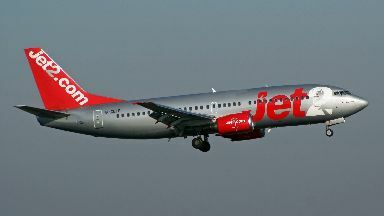 A spokeswoman for Jet2 confirmed the diversion was the result of a " minor technical fault." 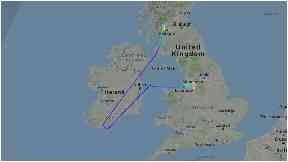 The fault is believed to be linked to a water supply used to supply teas and coffees on the aircraft. Passengers are expected to leave Manchester on a replacement flight on Sunday afternoon. Tracked: Flight LS155 turned back as it was flying over Cork.